I love denim overall and she styled it so well! The necklace makes all the différence! it’s true the first outfit is fantastic!! Love the giant pearl necklace. I’m a pearl girl! I have lots of vintage pearl necklaces and earrings on my website. I have so many I have to sell them. Love the contrast between pearls and the jeans overall! Works so well. Inspired! Will be using this combination. Sometimes the show outside is better then the one inside. Love these pink, the 1st is my fave. Adore the denim overall. 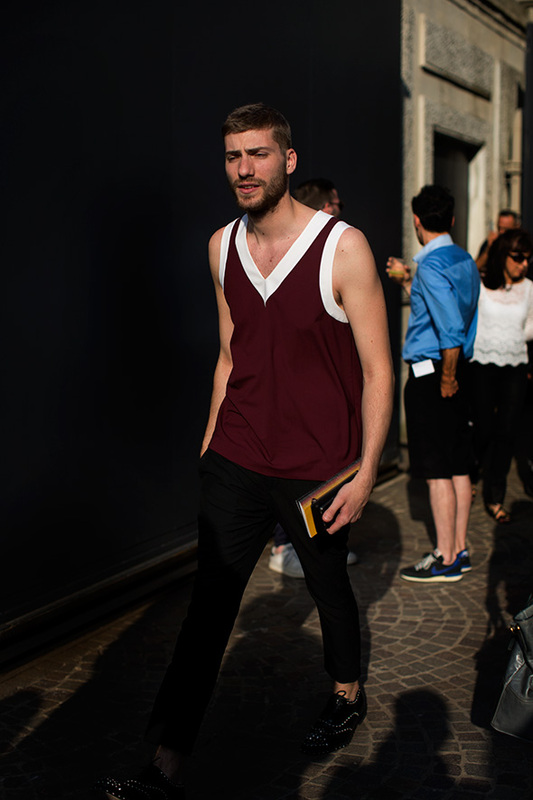 More Prada on the street shots please! great print in that last photo! Love the men’s shirts that are attracting your eye right now and love you photograph cool looking people over the age of 25 who are over so called ‘trends’ and know what really suits them. Thanks for sharing. Is it Renata Molho on the third picture ? Great sense of style. I love her outfit and allure. Elegant gesture. Adore these photos, so interesting! Love third pictures from the top: a great character study which is like a separate art in artistic photography. And the necklace in the first picture is heart-heart! That bandana printed denim shirt (wow that’s a lot of adjectives) gives me so much life… Do you know where he got it from? Really? I thought this Part III set is an antithesis to Part II which is pure style. Pic 1- no effort. Pic 2- Singlet over tailored pants???. Pic 3- She’s got character but tying a cardigan over a blouse that’s already short exposing belly? Pic 4- Why wear a crop shirt and have a t-shirt underneath. Layer gone wrong and the t-shirt material is too thick. “shorteralls” made recently famous by Lena Dunham’s character Hannah on the show Girls! not really an easy look to pull off! I usually don’t like every outfit in these composites, but I like every outfit in this one. As usual, Renata is my favourite, even though her clothes are rather wrinkled (or perhaps because of it!). Yeah! I’ve got the same dungarees and love them!! Really glad that you’re focusing on real people with real style, who just happen to work in fashion. All of these shots of overly made up, preciously styled and “perfectly” turned out walking billboards has just gotten too, too much. Renata Molho, always the best! Renata Molho is stunning- so much attitude, so classic and chic, love her little bracelets and those sunnies are a dream! Enfin une photo récente de Renata Molho, I missed her ! Bravo pour votre travail, cher Sartorialist. Now I want some overalls! Adore every one of these. Especially the dungarees and the last picture. That lad has it styled to the tee. Love the lady in third pic! So stylish & ladylike! Love the boy in maroon V-neck and cute shoes. And the lady in all white. No good reason except personal appeal. The older woman has great style. Inspiration! That woman knows how to work a cigarrette! Love Renata. But the girl in the hip-hop overalls–no she dint!! 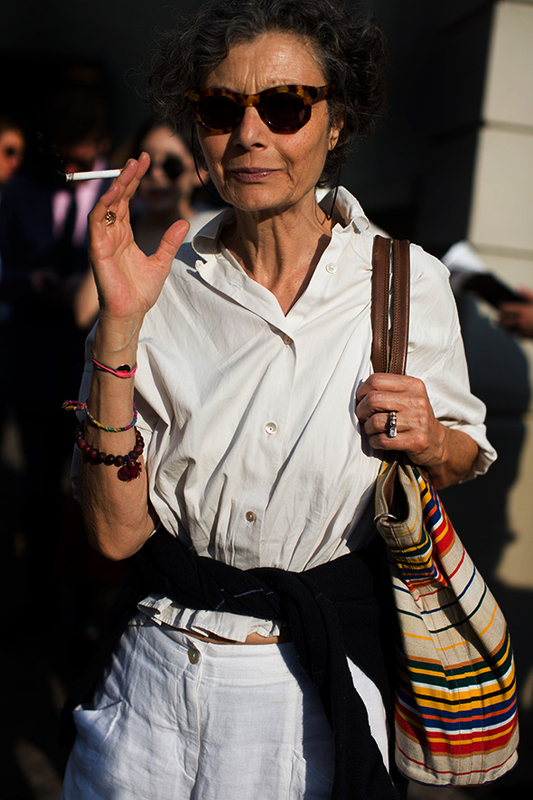 I love the woman with the cig. Gosh, I am tempted to get back into the overall phase, or shall I (at 61) keep them for the garden? Everybody should keep them for the garden, the backgarden. Nonsense. Wear them with confidence. I know you want to. I went through a massive overall stage, am I too old now or shall I keep them in the garden? Very cool. that third lady is a boss and then some. i want to be her. Denim shortalls? I suppose if they are in Milan they are fashionable. In America they are pretty much a sign you’ve given up. I do like the third photo – a lot of character there. I think overalls being fashionable depends largely on wether you are having fun wearing them, or if you have given up. Not so much what city you are in. I have seen soime very cute looks with them, especially in a skirt. I adore ALL these pictures. More please! Love Renata’s lipstick and sunglasses. What a beautiful cut that shirt has! It fits together very well, with the bordeaux tshirt!! I love the dungaree look and when styled with pearls it oozes downtime chic. 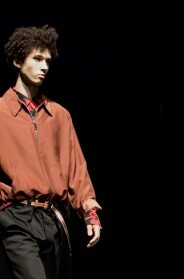 I try to get the tomboy look and give it a feminine edge on http://www.girlinmenswear.com – thoughts always welcome. overall girl is exactly what most men don’t want to see woman in – not that it’s important but it’s true. i want to grow up to be cigarette lady! This i kinda what i want my instagram to look like. If any of you want to give me some constructive critisism i would realy apreciate you checking out my instagram. My user name is Flawda. Thanks! These portraits are turning out to be some of the best shots I’ve seen in a while. Especially love that third one. Love the shirt on the guy in the last picture, that style of clothing is awesome. WishI could buy it where in live. Gredat post however I was wondering if you could wriite a litte more on this topic?